Governance is a “book” whose pages are opened to all leaders. Those who do not travel to meet genuine friends, discuss and cooperate, read only a page. No leader with concern for his people would ignore the rationale of this adage. President Paul Biya’s three-day state visit in response to Italian Sergio Mattarella’s invitation when he was in Cameroon barely a year ago, is a significant example of keeping in touch with people who care and know what it means to sustain relations that deliver the expected goods. However, what matters in this interdependence of states is not only visiting places and meeting people. The crux of the matter is discussing issues of mutual concern as was effected by Presidents Paul Biya and his host, Sergio Mattarella on Monday 20 March 2017, the first day of his visit to this great European cooperation partner. Since the establishment of diplomatic relations at ambassadorial level between the two countries in March 1962, Cameroon and Italy have proven that they are friends in need of each other. 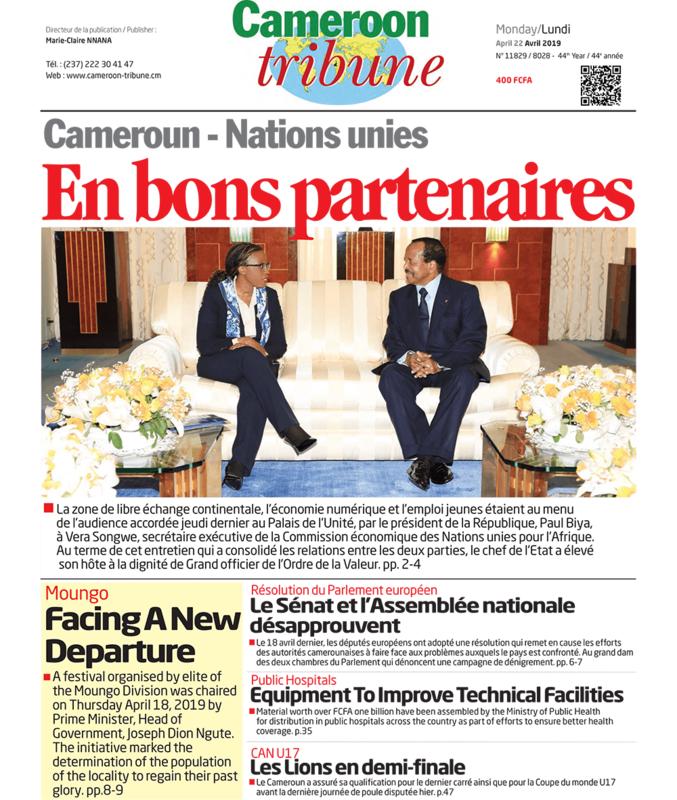 Such friendship void of colonial strings can be seen and felt through the kind of bilateral ties that have existed between the two countries since March 1962 barely two years after the attainment of independence by Cameroon. In this sustained efforts to maintain and reinforce the ties that make possible and effective cooperation between friendly nations, President Biya and his host, Sergio Mattarella during their talks on the first day of this state visit delved into issues which proved that both leaders pay attention to problems that rob them of political stability, peace, financial resources and cooperation, expected of nations with a quest for growth. Besides what Italy and Cameroon are already doing to prove that they are both members of an international community which can only survive if nations are committed to fruitful geopolitics, Presidents Paul Biya and Sergio Mattarella in their talks could not leave out the nightmare of terrorism, notably the destruction caused by Boko Haram in Cameroon, the disturbing situation in the English-speaking regions of the country, immigration and the plight of refugees. While making efforts to confront these unpleasant surprises, the Cameroonians and their leaders appreciate what friendly countries are doing to assist. In the case of Italy whose cooperation and friendship ties include bilateral trade in coffee, rubber, wood, leather and aluminium, to mention just these few, Cameroon appreciates what comes in from Italy to give the country the image it deserves in its quest for emergence. Besides our debt cancellation and contribution to mechanization, Italy’s commitment to the construction of the Olembe 60,000 seat Football stadium at a cost of some 163 billion CFA is a laudable gesture of joint action for progress. Cameroonians hope and believe that the Italian firm Entesa Sanpaolo, conscious of the fact that Cameroon will in the year 2019 host the African Nations Football continental tournament, will cooperate to make available this soccer infrastructure on time. Cameroon needs this cooperation besides the Italian Ceramic tiles, shoes, and clothing, just as Italy needs more cotton, leather, coffee and cocoa from its African cooperation partner. There is need to continue exploring other areas of bilateral cooperation. President Paul Biya’s visit to Italy at a time when anyone who sees a Cameroonian, especially abroad, hardly fails talking about football, Boko Haram and the Anglophone crisis is indeed , a glaring proof that even though problems are part of life, what remains a challenge is the use of wisdom, love of the country and dynamism to weather the storms. The President has been demonstrating this will by listening to the people, promising what he intends to do and fulfilling his promises. This should continue as Cameroonians look forward to more action aimed at redressing disturbing trends in the country. The challenge is for all Cameroonians, leaders and the led, teachers and the taught to reflect, and note that our friends abroad cannot afford all that we need for cleansing our enviable image, if we do not contribute our quotas. We therefore face the task of supporting all actions undertaken at home and abroad by our leaders not only to redress disturbing situations, but also to forge ahead as far as political stability, peace and development are concerned.